April 12, 2019 By Gary Paul Johnston & filed under All Articles, Handguns, Weapons. 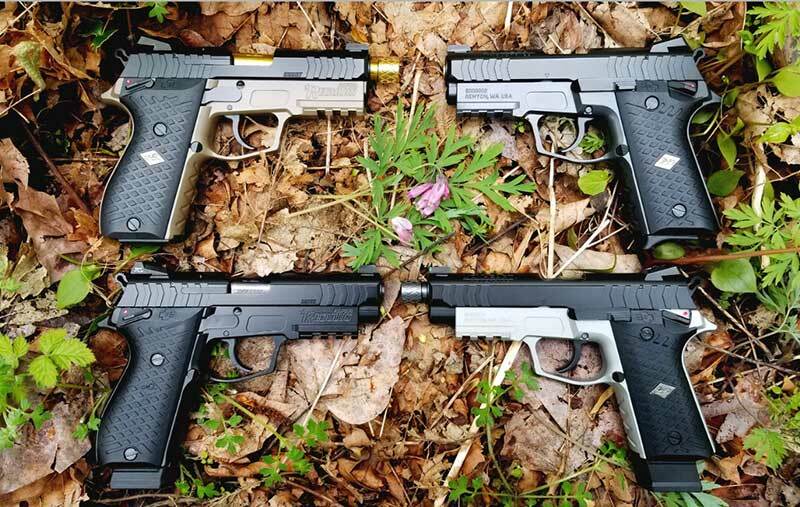 Lionheart produces two basic 9mm Regulus frames: Alpha and 1911 profile Beta, each totally interchangeable with its long and compact slide groups. Here are four of several combinations from which to choose. In terms of fire control systems, such handguns generally fall under single-action, double-action, and double action/single action (DA/SA—usually verbalized as SA/DA). This last mode is probably used in 50% of semi-automatic pistols today, with the rest single-action only and double-action only, with most triggers of the latter having extremely short distances of travel before they fire. DA/SA mode consists of a mechanism normally leaving the hammer in the down position with a combination safety/decocker in Safe or Fire condition. With the safety off, the pistol can be fired double-action, but after that shot, the pistol reloads itself through recoil and leaves the hammer cocked, so any additional shots will be fired in the single-action mode. 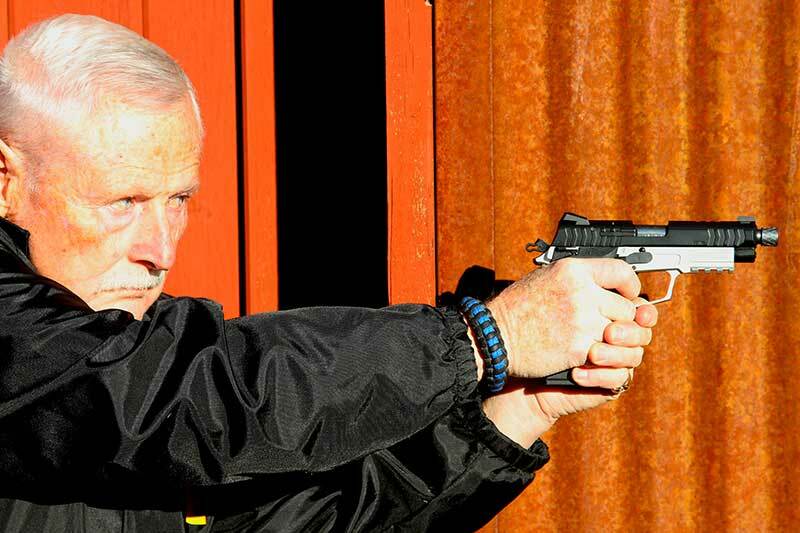 When no more shots are desired, the safety can be applied to safely allow the hammer to spring forward, where the pistol can be ready to repeat the cycle, or holstered with the safety left on or off. Once when my agency was in the process of adopting new pistols, I did a survey on how many officers would prefer a pistol with a short trigger let-off and no manual safety or one like the DA/SA ones they had been carrying for years with its safety/decocking lever. The vast majority preferred the option of having a manual safety, which they could carry off or on, but which had the advantage of being able to put the safety on when a “gun grab” seemed more likely, such as during a domestic or other emotionally charged incident. Although there is a movement afoot that doesn’t believe in having manual safeties on semiautomatic pistols, I have always preferred having one. Now there is a unique new 9x19mm pistol that has the advantage of both double- and single-action operation all in one. This Regulus Beta has a gold nitride barrel, an extended magazine and a Valkyrie Light mounted on its frame. Novak Adjustable sight is standard. Designed by South Korea’s Daewoo in 1984, the gun was adopted by the South Korean military as the K5 in 1989. The pistol’s mechanism was called the Fast Action and later the Triple Action. It operated like the FN Fast Action (only 15 prototypes made) and the Para-Ordnance Light Double Action (LDA) but was much simpler. In the early 1990s, a handful of a commercial variant of the K5 pistol was imported to the U.S. by several companies as the DP51. In 2011, S&T Motiv (formerly Daewoo) entered into an agreement with Lionheart Industries of Redmond, Washington, and Lionheart imported an improved version of the pistol for a time. 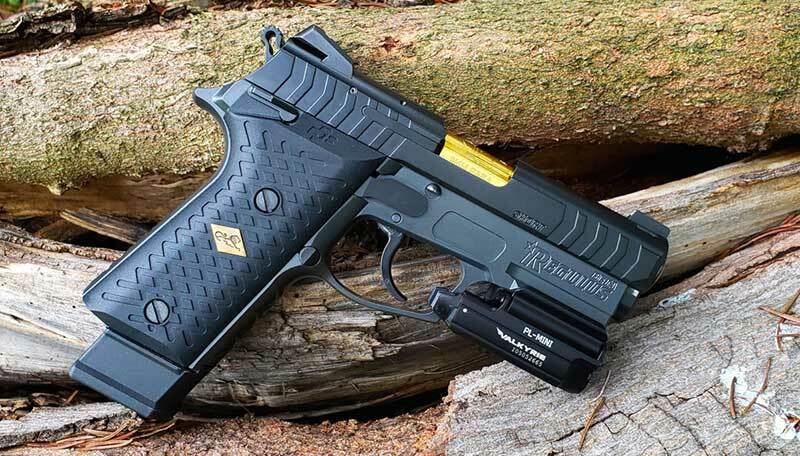 Then in 2016, Lionheart negotiated a license to manufacture an even more improved version of the pistol. 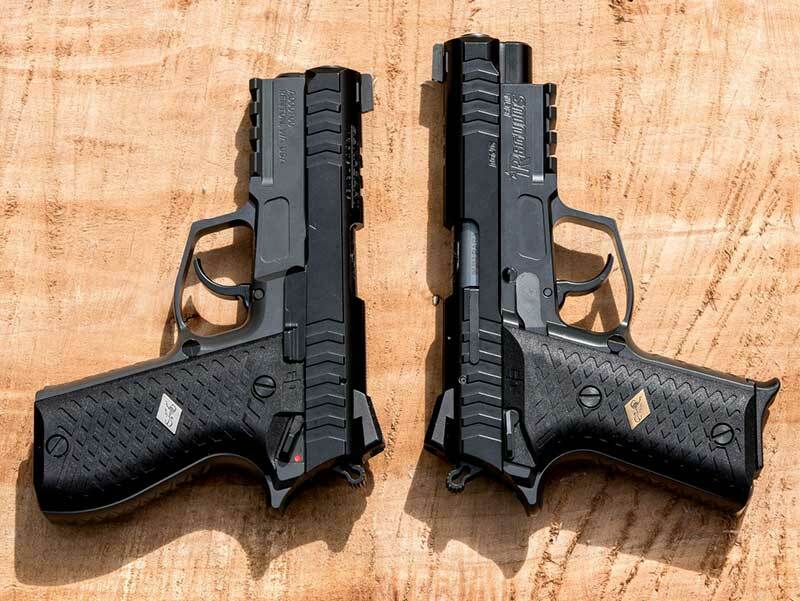 It is called the Regulus Double Action Plus, but no matter what it’s called, here’s how it works. After the pistol is loaded with a fresh magazine and the slide is racked and released, the hammer remains to the rear in what is normally the “cocked” position. So far, so good. The hammer, however, is not cocked, but is only remaining there until it is fired or manually pushed all the way forward, taking the trigger with it and leaving the separate sear in the cocked position. In any position, the safety can be put on. 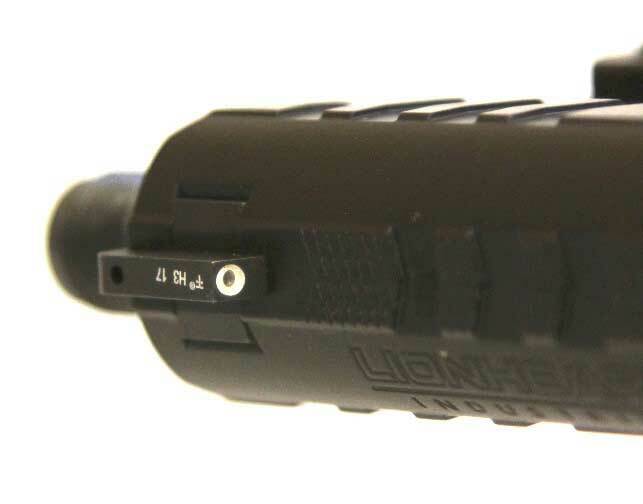 Regulus barrel is designed to use with either standard or compact slide. It has three locking lugs instead of the usual single lug at the front of the chamber, and its chamber is fully supported. In use, after chambering a cartridge, a person would normally put the ambidextrous thumb safety on and holster the Regulus or put it away. With the safety on, the trigger can be pulled all the way back (double-action style), but nothing will happen except it will return forward when released. But by moving the safety down to the FIRE position, the trigger can be pulled all the way back with a few ounces to where the draw bar contacts the sear. If a fast shot has to be made, the trigger can be pulled with one continuous motion to fire the pistol, barely feeling the 4.5-pound pull when contacting the sear. On the other hand, if the user intends to make a long precision shot, he simply brings the trigger back more slowly until the sear is contacted, and then presses for the single-action let off. In either case, the following shot is always single-action, or the hammer is again pushed forward, as above. When you think about it, this is a pretty good way to carry a pistol. When I practiced a short time with it, I found it worked better than any DA/SA transition pistol I’ve ever used, because that first DA pull is as light as the proverbial feather. Transitioning to the following single-action shot is a cinch. WHAT ABOUT THE REGULUS ITSELF? Regulus Alpha Compact (left) and Beta with standard long slide group. Both are finished in black Cerakote. There are two basic 9mm versions, one being a large-frame and full-size slide duty-type pistol with 4.1-inch barrel, or 4.7-inch barrel threaded 1/2×28 with a diamond knurled thread protector. The other is a large “Alpha” frame and compact slide with standard 3.7-inch barrel or 4.3-inch threaded barrel, as above. Oh, we’re not done, not by a long shot. Regulus comes with new Novak Adjustable rear sight. 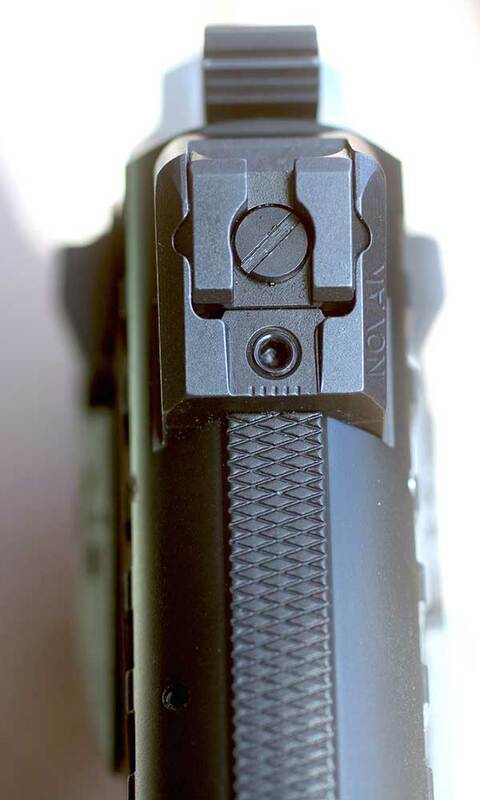 Regulus comes standard with tritium white-dot front sight dovetailed and pinned to the slide. This same arrangement is available in a “sister” Regulus that has a “Beta” frame grip patterned after the Model 1911. Once again, the slide groups are fully interchangeable with those of the other model, making it a totally modular platform. I received one variation of each, both with very low serial numbers. One was an Alpha Model with black frame and the other a Beta (1911 style) with silver Cerakote frame. Other colors are Grey Titanium-Nitride and Gold. While the slide group is made of Stress-Free Chromoly Steel, the Alpha and Beta frames are of 7075-T651 aircraft alloy. Disassembly of the Regulus is straightforward and similar to many self-loading pistols. After pointing the pistol in a safe direction, remove the magazine and check the chamber to make sure it is empty. Then leaving the hammer cocked, retract the slide until an inverted triangle lines up with the forward part of the slide-stop lever. Hold the slide here under the pressure of the recoil spring while pushing the slide-stop pin in from the right side of the frame. When the slide stop protrudes from the left side, pull it the rest of the way out while holding the slide group from coming off the front. Let the slide group come off the frame slowly, and carefully remove the recoil spring and plunger, then lift out the barrel from the rear. Reassemble in reverse order. Most of the special custom-grade external features of the Regulus are obvious: the undercut frame, large trigger guard, aggressive front and back straps, heat-resistant polymer grips, and beautiful diamond crosshatch machining on the slide. The frame also has a semi-rectangular cutout above the trigger guard where one can place the index finger away from the trigger. On the top of the chamber is a crown above the head of a lion over USA. The Regulus’ sights are as aesthetic as they are utilitarian, with the rear being the new Novak Adjustable sight and the front a dovetailed Novak. The Novak Adjustable rear sight comes with a tritium bar at six o’clock and is click adjustable for elevation and drift adjustable by first loosening a hex bolt. The Novak front sight comes standard with a Trijicon Tritium insert, with a TruGlo insert available as an option. As you read this, a new set of higher Novak Adjustable rear and front sights will be seen on Regulus pistols with threaded barrels that are dedicated to be used with a suppressor. Johnston found Regulus reliable and accurate, with a unique fire control system. 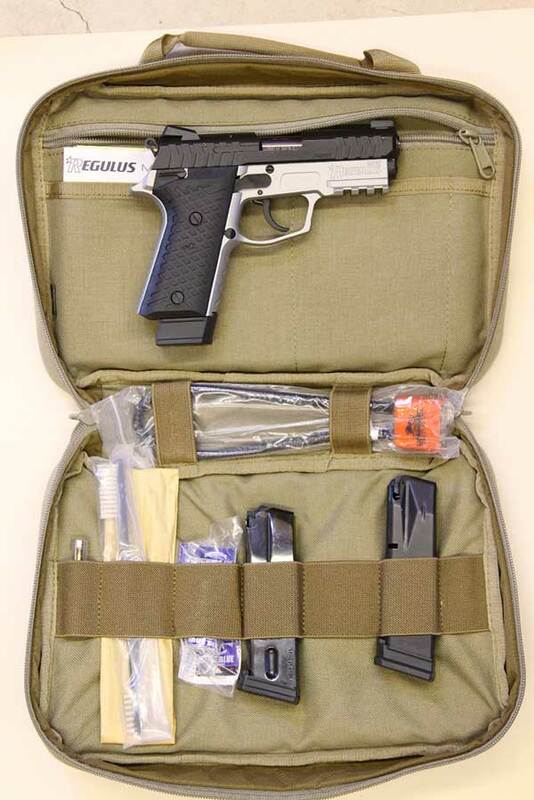 Regulus comes in deluxe padded case with three magazines and accessories. With CNC machinery having brought virtually all moving parts to the highest levels, it’s no surprise that Lionheart Industries has taken full advantage of it both inside and out. The Regulus’ slide-to-frame fit defines perfection, as does the fit of the barrel to both the slide and frame at both ends. I have never seen a greater fitting of parts and this assures the highest degree of accuracy right out of the box. In reassembling the Regulus, one doesn’t merely “drop” the barrel back into the slide, but “fits” it back into place! While little time is usually spent on magazines, the Regulus’ 15- and 18-round double stack/single position magazines are simply something to see, touch, and operate. They are the utmost in quality and design to function and feed to perfection! In testing the two Regulus pistols, I switched upper components back and forth with barrels, slides, and frames. All combinations worked flawlessly with zero malfunctions of any kind using numerous brands for function and fun. From prone or bench rest, good hits on silhouette targets at 100 yards were possible, and five-shot groups of from 2.48 to 4.29 inches were easily made at 25 yards. Black Hills 125-grain 9mm HoneyBadger, Federal 147-grain HST, and Hornady 115-grain Critical Defense giving the best accuracy. Fast double-action (DA+) first shots were easily placed center of mass at from three to five yards, especially with the Beta Regulus. I attribute this to the Beta pistol’s trigger having a slightly better letoff. The Alpha pistol single-action broke at 4.8 pounds with a tiny bit of creep, while the Beta broke clean at 4.6 pounds. The Regulus Beta model also has the 1911-style grip frame, which I prefer. A few hundred more rounds through the pistols may smooth out both triggers even more. The Regulus comes with three magazines in a very nice tan zippered and dual-handled case with a cleaning kit, True Blue Oil sample, gunlock, two spare magazines, and an instruction booklet. Is the Regulus for everyone? Probably not. It is a unique system to say the least, and should appeal to discriminating shooters and collectors of high-grade firearms.